LONG BEACH, Calif.—The retail industry is in the middle of an enormous transformation, growing at a pace that exceeds the gross domestic product and adding about 70,000 jobs this year. Brick-and-mortar retailers as well as e-commerce providers are working to expand their offerings, which will place new demands on the supply chain. 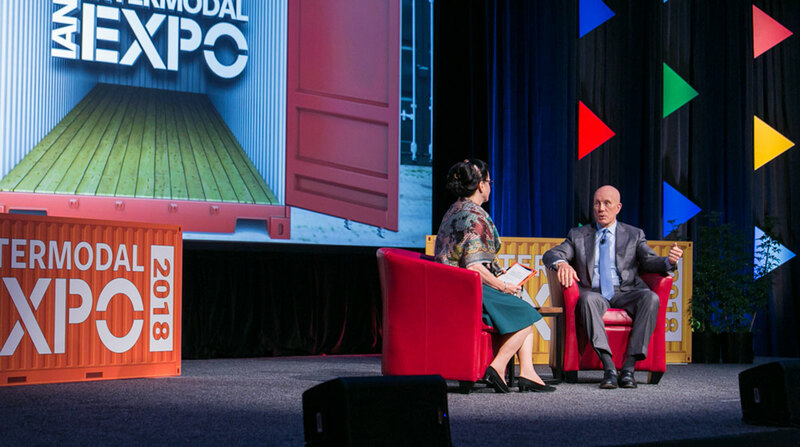 National Retail Federation CEO Matthew Shay shared those thoughts during the Intermodal Association of North America’s Intermodal Expo 2018 here Sept. 18. Because retail touches everyone everywhere every day, consumers’ expectations put increased pressure on shippers. He said those within the supply chain need to take a strategic approach to shipments and think of the value they can add, especially as consumers demand next day or even same-day shipments. “They should be approaching this with the mindset that it has to be a true partnership because we know that since the recession customers have changed,” Shay said. Consumers also expect free shipping and returns, which has pressures and implications for everyone in the supply chain, he said. The National Retail Federation supports investment in infrastructure and is working with partners in Washington, D.C., such as IANA as well as trucking and railroad associations to advocate on Capitol Hill, Shay said. However, NRF hasn’t taken a position on how to fund infrastructure, Shay said. He expects retail growth to remain strong the rest of the year, and NRF recently announced it anticipates retail sales to increase a minimum of 4.5-5% this year. Adding to the growth is lines between online and traditional retail channels are continuing to blur. Traditional brick-and-mortar stores, such as Nordstrom, Target and Walmart, are investing in e-commerce capabilities, while traditional e-commerce players, such as Amazon, are investing in brick-and-mortar stores. Plus, more brick-and-mortar stores built than closed last year, at a 2-to-1 ratio, Shay said.